The Ministry of Information and Communications Technology and National Guidance was established in June 2006 with a mandate of providing strategic and technical leadership, overall coordination, support and advocacy on all matters of policy, laws, regulations and strategy for the ICT sector.It also ensures sustainable, efficient and effective development, harnessing and utilization of ICT in all spheres of life to enable the country achieve its national development goals. The Ministry is headed by a Minister who is assisted by one Minister of State. The Directorate of ICT infrastructure and Investment comprises the Department of ICT Infrastructure Planning and Technology Support and Department of Communication Network. The Directorate of Information Technology Services comprises the Department of ICT Research and Development and the Department of E-services. The directorate of Information and National Guidance comprises the Department of Information Dissemination & Public Relations and the Department of National Guidance. In addition, there is the Department of Finance and Administration headed by The Permanent Secretary; The Department of Finance and Administration provides support services to the entire Ministry and is comprised of several Units including Administration, Policy & Planning Division, Procurement Unit, Internal Audit, Human Resource Management Division, and Resource Center. 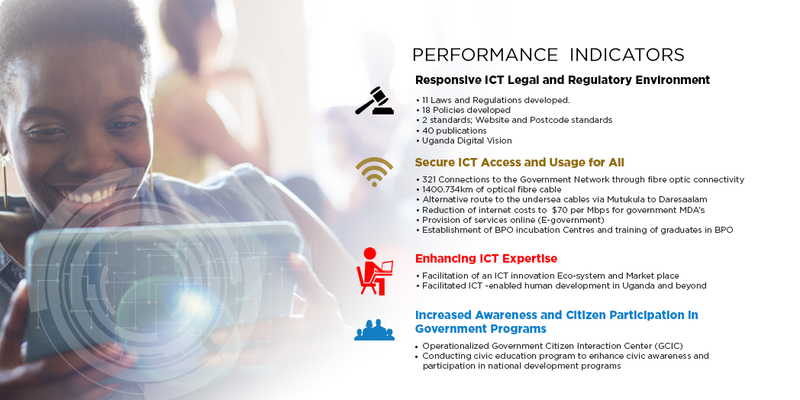 Ministry of ICT & National Guidance – being responsible for ICT legal and regulatory environment; Secure ICT access and usage for all; increased employment and growth opportunities and increased awareness and citizen participation in government programs. Uganda Communications Commission – being responsible for regulatory environment of the communications sector including broadcasting; efficient and effective management of scarce Communications resources; fostering efficient/healthy competition; consumer protection; research and development of human resource in sector. National Information Technology Authority-Uganda (NITA-U) – being responsible for a rationalized and integrated national IT infrastructure; e-government services in MDAs; regulation of IT environment in public and private sector; capacity building and awareness creation; information security and development of information technology enabled services/business process outsourcing (ITES/BPO) industry. Uganda Post Limited (UPL) – being responsible for offering a wide range of postal, communications and logistical services; financial services (Money orders); passenger transport and parcel delivery services. Uganda Institute of Information and Communications Technology UICT) -being responsible to train and conduct courses, seminars and workshops, and create public awareness of the communications sector. 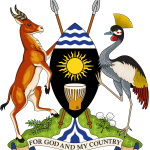 Uganda Broadcasting Corporation (UBC) – being the national broadcaster providing radio and television broadcasting services and programmes. The Uganda Media Centre (UMC) – being responsible to provide professional media and communication services to government departments; foster a communication environment between government and the media and to integrate the international marketing of Uganda into the broader communication strategy of government. The Media Council – being responsible for regulation and promotion of ethical standards and discipline of journalists; arbitrate disputes between the public and the media; censor films, videotapes plays and other related apparatuses. The Vision Group – a multimedia business housing newspapers, magazines, internet publishing, televisions, radios, commercial printing, advertising and distribution services. The Parliamentary Committee on Information, Communication Technology and National Guidance – oversees the Ministry of Information, Communication Technology and National Guidance and covers policy matters under the Ministry. The ICT and National Guidance Sector Working Group – with a role to harmonize, coordinate, monitor, evaluate and report on the sector vision and goals, policy frameworks, plans, and performance of all sector MDAs. Comprises of membership from Sector MDAs, representatives of Civil Society Organizations, Local Governments private sector, institutions associated with the sector, and representatives of development partners. It is headed by the Sector lead – Ministry of ICT & National Guidance.